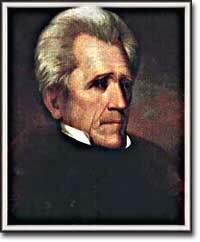 Andrew Jackson considered himself a spokesperson for the common man. The west led the path by having no property requirements for voting, which the eastern states soon adopted, as well. The Common Man always held a special place in America, but with Jackson, he rose to the top of the American political power system. In the campaign of 1828, Jackson, known as "Old Hickory," triumphed over the aristocratic, reclusive and unpopular incumbent President John Quincy Adams. The first six Presidents were from the same mold: wealthy, educated, and from the east. Jackson was a self-made man who declared education an unnecessary requirement for political leadership. Indeed, Jackson launched the era when politicians would desperately try to show how poor they had been. 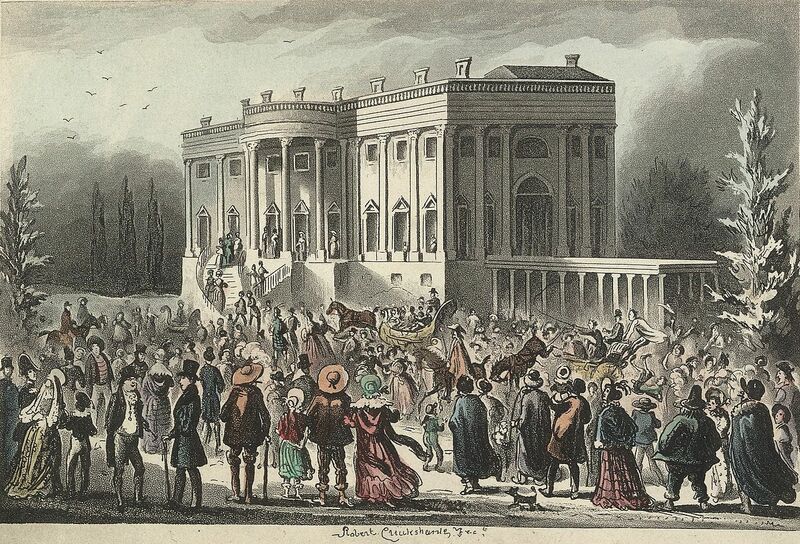 A mob of well-wishers showed up at the White House for Jackson's 1828 inauguration. The election of 1828 was a rematch of the election of 1824 between John Quincy Adams and Jackson. In the earlier election, Jackson received more votes, but with no candidate having a majority, the House of Representatives chose Adams. Four years later the voices of the people were finally heard. Jackson's inauguration in 1828 seemed to many the embodiment of "mob rule" by uneducated ruffians. Jackson rode to the White House followed by a swarm of well-wishers who were invited in. Muddy hob-nailed boots trod over new carpets, glassware and crockery were smashed, and chaos generally reigned. 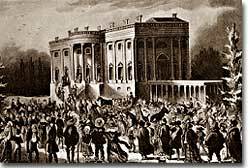 After a time, Jackson ordered the punch bowls moved outside to the White House lawn, and the crowd followed. Naturally, Jackson's critics were quick to point to the party as the beginning of the "reign of King Mob." As a military hero, a frontiersman, and a populist, Jackson enchanted the common people and alarmed the political, social and economic elite. A Man of the People would now govern the nation — America did not disintegrate into anarchy. North Carolina is so proud of their native son, Andrew Jackson, that they wrote an online biography of him. From his birth in the Waxhaws area near the border between North and South Carolina to his retirement from the presidency, this website provides a brief, but detailed review of Jackson's life. The site's presentation, however, is bland with no pictures. Straight from the POTUS (Presidents of the United States) project at the Internet Public Library, this website is a great place to start an exploration of Andrew Jackson. The page includes presidential election results, Jackson's Cabinet members, and notable events in the Jackson administration. It also has links to internet biographies, historical documents, and points of interest such as Jackson's mansion, the Hermitage. This inspiring website from the Hermitage, Andrew Jackson's plantation, provides a favorable account of Andrew Jackson's life and character. 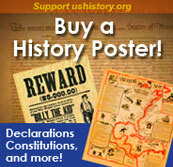 Pages deal with topics like "Jackson's Hermitage," "Andrew Jackson," and "Archaeology." The site has a ton of graphics and interesting facts about the former President. The heading of this site may say "A Brief Biography of Andrew Jackson" but don't let it fool you. This immense website from the University of Gronigen spans 22 pages of Jackson's most important contributions, and also includes extras like Jackson's duel and the Jacksonian era. A wealth of information is stored at this website, but the easy navigation makes finding what you need a breeze. The party was smaller at the second inaugural, but the speech was just as important. I have been called by voluntary suffrages of my country, I avail myself of this occasion to express the deep and heartfelt gratitude with which a testimonial of such distinguished favor has been received. -Andrew Jackson, first Inaugural address.